Citation: C N Trueman "Japanese-American families"
The Japanese-American families were one of the smaller minority groups in the United States in 1941 but after the attack on Pearl Harbour, Japanese-American families were seen as the ‘enemy within’ and were put in internment. The Japanese-American families were sent to War Relocation Centers which were placed in isolated areas that were easy to guard. Two of these were in California and another eight were in the desert region of the south-west. In total, 110,000 people were placed in these centers. The centers were surrounded by barbed wire and machine gun posts. The only possessions allowed during travel to these centers was what you could carry – nothing else. Japanese settlers had first arrived in California at the end of the C19th. They found employment as labourers in the constantly expanding state. By 1920, they had built up a multi-million dollar farming industry feeding the cities of California. This success in such a short space of time had made the Japanese community enemies within the state. The law stated that the original settlers from Japan could not own the land they farmed – they had to wait until the second generation of Japanese-Americans; the Nisei. There was understandable outrage in the United States when Japanese forces attacked Pearl Harbour. The shock came from the president down – Roosevelt described the attack as a “dastardly act”. However, there was little public reaction against the Japanese-American community – the attack had been planned in Tokyo, not the farms of California. Nor did America’s security forces panic. The FBI arrested 2000 people whose loyalty could not be trusted. But it concluded that the rest were loyal to the United States. 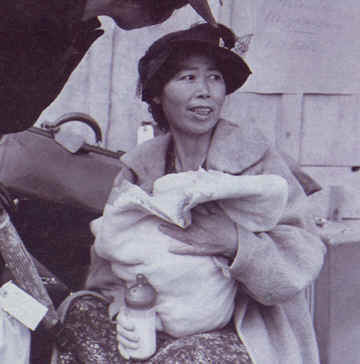 However, the business community in California, led by the Los Angeles Chamber of Commerce, demanded the internment of Japanese-American families. “We are charged with wanting to get rid of the Japs for selfish reasons. We might as well be honest. We do.”Austin Anson, secretary of the farmers’ organisation. California’s Attorney-General was Earl Warren. He stated that law enforcement officers had concluded that the Nisei were more dangerous to America’s security than their parents. State newspapers printed lurid claims that plots had been discovered. Some bordered on the absurd – that Japanese farmers had planted tomato crops that when the plants blossomed, they would point like an arrow to military installations to assist Japanese bombers. Reports were published that the FBI had found hidden radio transmitters (they had not). The state’s water supply was also going to be poisoned by the Japanese-Americans. When it was pointed out that this had not happened, the state media responded by stating that their own alertness had stopped the Japanese-Americans from doing this as the state had been warned early enough. Such stories whipped up hysteria in some quarters and very few in California went public to speak out against internment. While Japanese-American families were interned, they businesses were taken over. “New Management by White American” was a frequently seen sign in some areas of California. After the war, it was estimated that the Japanese-American community had lost about $400 million in terms of property etc. They received $38 million in compensation. In February 1943, Roosevelt issued a proclamation that stated that any Japanese-American who signed a pledge of loyalty would be freed from internment and could work for the war effort. Some 6000 served in the Pacific, many as interpreters and Intelligence agents. As late as 1968, the American government admitted that the War Relocation Centers had not been destroyed.